Home directory, e.g. https://euroassembler.eu/ or file:///C:/euroasm/. /euroasm.css Cascading Style Sheet for all EuroAssembler HTML pages. /euroasm.exe The main executable file for MS Windows. It should be moved to %PATH% directory at installation time. /generate.zip Auxilliary files useful in further €ASM developement. Not necessary for ordinary EuroAssembler users. /generate.zip:eatests\testman.php Test manager for €ASM developers. /generate.zip:euroasm.ppr Project file for the text editor PSPad. /generate.zip:generate.php HTML mass update scripts for €ASM developers. /generate.zip:links.ini Definition of external links to resources useful for €ASM developement. /generate.zip:sitemap.ini Declaration of €ASM files and their properties, used to generate HTML. /index.htm Alphabetical index of EuroAssembler language elements, instructions, macros, options. /search.php Script used to find a string in all text files on this site. /sitemap.htm List of EuroAssembler directories, files and their description. Download directory of EuroAssembler. Not embedded in distribution. /download/euroasm.??????? ?.zip Previous versions ???????? of EuroAssembler. Not embedded in euroasm.zip . /download/euroasm.zip The latest version of EuroAssembler. Not embedded in euroasm.zip . /download/index.htm Overview of EuroAssembler versions and history. Not embedded in euroasm.zip . 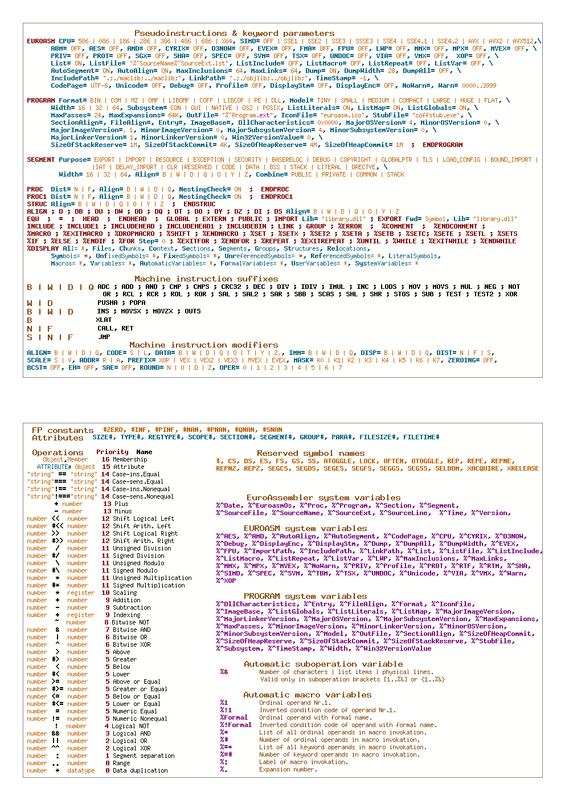 /eadoc/euroasm.png EuroAssembler reference card, ready to print on A4 paper. /eadoc/index.htm Documentation in the language mutation chosen at installation time. /eadoc/links.htm External references, errata and links to authoritative resources used in €ASM developement. /eadoc/man_?? ?.htm Documentation, translated. ??? is three-letter language code. /easource/chunk.htm Chunk of source file . /easource/coffstub.htm 16bit DOS MZ program linked to Windows executables. /easource/euroasm.htm The main EuroAssembler source and linker script. /easource/index.htm Source overview and signpost of €ASM source files. /easource/member.htm Member of structure or library. /easource/pass.htm Assembly pass through the source. /easource/pfrsrc.htm Program input format RSRC. /easource/syswin.htm Oper.system MS Windows calls. Directory with EuroAssembler test files. /eatests/index.htm Overview and signpost of €ASM test files. /eatests/manager.php Proxy script for access to eatests/testman.php on developement site. /eatests/t??? ?.htm €ASM test files. See TestList for their description. Discussion board (phpBB). Not embedded in distribution. /forum/index.php Board category overview. Not embedded in distribution. Libraries of macros, structures and constant symbols includable into €ASM sources. /maclib/bioss.htm BIOS structures + symbols. /maclib/doss.htm DOS structures and symbols. /maclib/fastcall.htm FastCall Windows 64bit calling-convention macros. /maclib/index.htm Overview of €ASM macro libraries. /maclib/linabi.htm Linux 64bit SYSCALL ABI interface. /maclib/linapi.htm Linux 32bit INT 0x80 API interface. /maclib/linsfile.htm Struc+symbols for file access in LinAPI. /maclib/stdcal16.htm StdCall 16bit calling-convention macros. /maclib/stdcal32.htm StdCall 32bit calling-convention macros. /maclib/stdcal64.htm StdCall 64bit calling-convention macros. /maclib/string16.htm Operations with zero-terminated strings. /maclib/string32.htm Operations with zero-terminated strings. /maclib/string64.htm Operations with zero-terminated strings. /maclib/sysvcall.htm System V 64bit calling-convention macros. /maclib/winabi.htm Macros for core 64bit MS Windows functions. /maclib/winansi.htm List of MS Windows API functions with ANSI+WIDE variants. /maclib/winapi.htm Macros for core 32bit MS Windows functions. /maclib/winfile.htm Wrappers of Windows file functions. /maclib/wins.htm Struc+symbols for base functions in WinAPI. /maclib/winscon.htm Struc+symbols for console subsystem in WinAPI. /maclib/winsdlg.htm Struc+symbols for common dialogs in WinAPI. /maclib/winsfile.htm Struc+symbols for file access in WinAPI. /maclib/winsgui.htm Struc+symbols for graphic subsystem in WinAPI. /maclib/winsnet.htm Struc+symbols for networking in WinAPI. /maclib/winsprn.htm Struc+symbols for printing in WinAPI. /maclib/winsreg.htm Struc+symbols for registry access in WinAPI. /maclib/winssec.htm Struc+symbols for security management in WinAPI. /maclib/winstime.htm Struc+symbols for time functions in WinAPI. Libraries of objects linkable to €ASM sources. /objlib/euroasm.rc Resource script which can be compiled to euroasm.res . /objlib/euroasm.res Compiled resource file used in €ASM tests. /objlib/index.htm Overview of linkable object libraries and sample projects. /objlib/skelet.rc Resource script used in sample projects skelet32.htm and skelet64.htm . /objlib/skelet.res Compiled resources used in sample projects skelet32.htm and skelet64.htm . /objlib/winapi.lib MS Windows API import library generated by DLL2LIB. Sample projects in BINary format. /probin/boot16.htm Boot sector of floppy disk. /probin/kblock.htm DOS driver for locking keyboard during boot. /prodos16/kbunlock.htm DOS program for unlocking keyboard locked by kblock.sys. /prodos16/tsrclock.htm DOS TSR program which displays time in text mode. /prodos16/tsrup.htm DOS TSR program self-installable to upper memory. Sample 32bit projects for Linux. Sample 64bit projects for Linux. Sample 32bit projects for MS Windows. /prowin32/boxdraw.htm Windows console application which converts OEM encoded BOX DRAWING characters 0xB0..0xDF to HTML entities. /prowin32/cpmix32.htm Demo mixing alphabets from many languages in GUI and CON Window. /prowin32/dll2ansi.htm Program which creates the list of exported function with ANSI and WIDE variant. /prowin32/dll2lib.htm Linker script which creates import libraries from MS Windows DLL. /prowin32/euroconv.htm Dual DOS|Windows console|windowed application for conversion of text file encoding. /prowin32/locktest.htm Dual DOS|Windows console application for testing keyboard Lock indicator status in batch files. /prowin32/lstview.htm Window 32bit GUI application for viewing €ASM listing. /prowin32/skelet32.htm Skeleton of a primitive Windows GUI program with standard menu and status bar. /prowin32/testman.htm Compiled test manager for €ASM tests. Sample 64bit projects for MS Windows. /prowin64/cpmix64.htm Demo mixing alphabets from many languages in GUI and CON Window. /prowin64/lstview4.htm Window 64bit GUI application for viewing €ASM listing. /prowin64/skelet64.htm Skeleton of a primitive Windows GUI program with standard menu and status bar.